Reduce plastic waste by picking up a pair of to-go utensils, which are made out of bamboo. Visit their online shop. 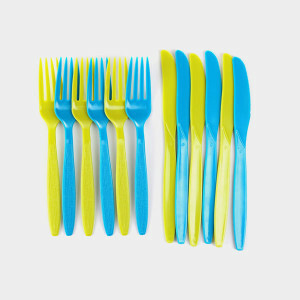 If you buy plastic utensils for a party or event, wash and store them to use later. While flimsy plastic utensils might not hold up over time, if you buy thicker utensils, you can get more uses before recycling them. Compostable Utensils: Not the Most Eco-Friendly of Them All? Out of all types of utensils — compostable, plastic and reusable — compostables are advertised as being the most eco-friendly. However, reusable utensils are still the front-runner because they are easily recycled and not single-use. There’s a good chance that compostable items will end up in a landfill due to the absence of compost collection services in many places.